Starting April 29, and continuing until October 3, the Pattullo Bridge deck will be under rehab construction to keep the roadway safe. Only two lanes will be open during the five months of work. You can still use the bridge, but obviously this will impact your travel times and your trip planning around the lower mainland. We’ve gathered some information from TransLink (they operate the Pattullo) and provided some suggestions so you’re better prepared. The first weekend: The bridge will close from the Friday night (April 29, 8pm) to the Monday morning (May 2, 5am) to let crews set up for construction work. From May 2 to Sept. 30, the bridge will stay open with one lane in each direction. The last weekend: Pattullo will close from the September 30th evening (8pm) to the October 3rd morning (5am) to remove equipment. 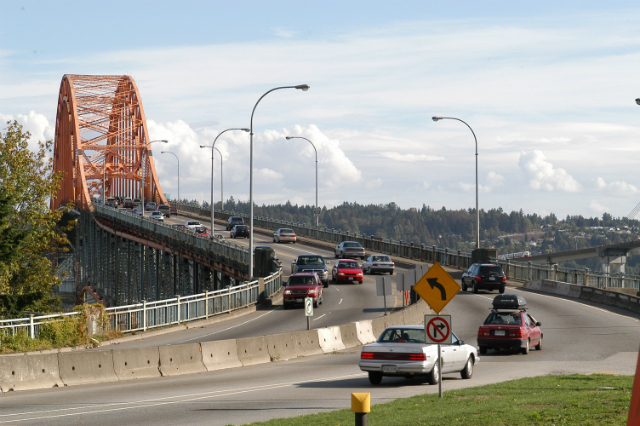 Regular truck traffic will continue over the bridge during rehabilitation however, the current restrictions for trucks will remain in place on the Pattullo Bridge throughout the repair work: 1. No oversize/overweight vehicles. 2. No vehicles with a gross weight over 64,000 kg. Keep in mind that even minor vehicle incidents on the bridge will cause significant delays and potentially a full bridge closure. Remember to check webcams for the Patullo, Port Mann and Alex Fraser Bridges. Webcams – The Pattullo Bridge, and alternate routes Port Mann Bridge and Alex Fraser Bridge, all have highway webcams so you can have a timely view of traffic. DriveBC – a great resource for timely message signs with estimated travel times, traffic incidents, weather forecasts, current and planned construction on various routes and all those webcams. On Twitter? DriveBC is tweeting estimated morning westbound and afternoon eastbound delay times for Pattullo Bridge, Port Mann Bridge, Alex Fraser Bridge and George Massey Tunnel. Refer to the table below to view map coordinates and estimated travel times. TransLink – has set up a website to keep you up-to-date with additional information and travel resources. Take transit – Seven additional parking locations near New Westminster Station, Scott Road Station and Surrey Central Station have been identified, in addition to existing Park and Ride lots, to make it easier for drivers to connect to transit. To find them, go to Translink’s website and click on the TRAVEL TOOLS tab. On the PARKING LOCATIONS map, the yellow pins are the additional parking locations while the others are pre-existing. Additional service hours have also been added to the 101, 104, 128, 155, 340 and the 410 bus routes. Start a carpool – make some friends. Get on your bike – as mentioned, the Pattullo Bridge will be fully open to cyclists during construction. Please plan ahead and give yourself some extra time, no matter which route you take. If you have any questions about the project, or about the plans for replacing the Pattullo Bridge, please connect to TransLink. Here’s a point I think we are missing. If we go back pre- expo, the media and the government kept hammering at this idea that Vancouver needed to be put on the map. That we were all going to benefit economically and how much better life would be. Zoom forward to today, with the population doubled,and we see a whole different picture. They (government and media) talk about how we need to conserve water, reduce waste, pay tolls, fees, etc. They say it’s for the environment, but no admits to the elephant in the room : overpopulation. High density living is almost unmanageable. I’ll explain in a real life example. Los Angeles is a city of sprawl. A massive population that needs to get to work every day. So how does it compare to Vancouver? Easily drivable to anywhere you want to go. Car accident on the freeway? When this happens in L.A. the vehicles must leave the road way immediately or will be pushed off by special trucks, who’s soul job is to do this. Public transit? Flat rate $2. Never once had to stand. A train from say Anaheim to downtown L.A. $8. Booze, food on the train. Stations and trains never crowded. Now back to our beloved Vancouver. People have been moving here at a faster rate than we can manage. Our population has doubled since expo. Has our hospitals? As for the economic benefits we were promised by opening up our city to everyone. In 1986 I worked in a warehouse as a shipper/Receiver. The pay:$15/hr. In 2016,my son in law works as a shipper/receiver. The pay:$13/hr. I honestly look at it this way:After being here for generations in creating and building a city to call our own to now being told to start paying for the crowds is an idea that doesn’t work on me. Well it has been one week of this mess, and I think enough time to see that this really is a disaster for a great many people and businesses. The schedule of the work needs to be acclerated, to be finished before September 2016. The traffic right now on some of the affected corridors is WORSE than a normal “back to school” september/october period. Loaded 18 wheelers need be banned from the Alex Fraser and Patullo immediately during the morning and afternoon rush hour periods. The extra air pollution alone from all the idling cars alone is enough, adding in the 18 wheelers grinding their gears and blood pressure is completely unnecessary. Level the playing field for the trucking community and shift their delivery times outside the peak of this mess. And is the speed limit really 30 km/hr on Patullo, enforced with radar? That will really restrict the vehicle through put…. Put up to at least 40! The port mann is not an option for a great many. There are too many industrial park based jobs in Richmond, and too much traffic leaves richmond each day, you should see the Knight street bridge backups and Tunnel each day so far. Why? Because the Queensborough/Alex Fraser is jammed, because of the Patullo reductions. Change something before we all choke. No trucks 6-9 AM and 3-6 pm. Its easy! Thanks for connecting with us here. We have shared your concerns regarding acceleration of the project time and truck time use to TransLink. Because the Pattullo Bridge is an important truck route in the Lower Mainland and truck route networks like this are vital to the economy to help make sure goods get to the people and businesses that use them every day, trucks will not be banned on the Pattullo during rehabilitation. This project is forcing thousands of commuters who live in the areas surrounding Vancouver to pay a bridge toll. Many who are part of the working class and don’t live in the city due to high living costs. For most of us, there is no logical alternative route to access the city so we are forced to take the Port Mann Bridge twice a day. The least The Ministry of Transportation could do is lower the toll, if not remove it for the duration of the Pattullo Bridge rehabilitation. I understand that the Pattullo bridge needs to be upgraded, but this re-routing seems like a convenient cash grab. There are even Port Mann endorsements on the radio: “Give Port Mann a shot!” – are you kidding me!? They say the toll is needed to pay off the crossing, but it’s not fair to place all that debt on the commuters from Langley, Surrey, Cloverdale, Maple Ridge, etc. Denying the working class a taxed-free commute into the city is unfair and should be taken into consideration. Thanks for connecting with us here and sharing your concern. We understand the significant impacts this rehabilitation work is having on commuters and want to let you know that the Alex Fraser Bridge and the George Massey Tunnel are un-tolled options available to you apart from using the Port Mann Bridge. TransLink has also increased transit service in affected areas and is encouraging carpooling and car sharing during this time to reduce the volume of traffic on the road during this time. We hope that this helps! Complete agreement to many previous posts. Ban the semis. Most drive at 10km/h across two lanes and slow down the rest of traffic. Thanks for connecting with us here. We have shared your concern regarding truck use to TransLink; however, because the Pattullo Bridge is an important truck route in the Lower Mainland and truck route networks like this are vital to the economy to help make sure goods get to the people and businesses that use them every day, trucks will not be banned on the Pattullo during rehabilitation. We expect that some trucks may opt to take alternate routes; however it’s important that we maintain truck access for all drivers, including trucks that want to continue using the crossing. 2. No vehicles with a gross weight over 64,000 kg. Thank you for sharing your concern with us here. The Pattullo Bridge is under the care of TransLink and we continue to communicate the concerns shared here about trucks using the bridge directly with them. Oversized and overweight truck traffic continues to be banned from using the bridge during rehabilitation. We will share this comment forward with them as well. Due to this rehabilitation project & the extreme increase in major traffic congestion that is going to ensure; Front Street is already closed. New Westminster is already a bottleneck. Almost all semi-trucks use 2 lanes to cross the Pattullo Bridge. There is no alternative for many drivers due to commute time, lack of transit access, or crazy tolls. I’ve decided to leave this planet & return to Mars for 6 months. I will try to reinhabit…I mean rehabilitate this planet, particularly Translink, in 6 months. The Patullo is the most direct route for me to get to work. Both the Alex Fraser and Port Mann take me out of the way. This is a huge inconvenience and additional cost for me and my family. Hello and thanks for connecting with us here. We know this will be a challenging five months for commuters, and understand your frustration. We are encouraging commuters to give themselves extra travel time, try carpooling or try travelling out of normal commuting hours. TransLink has more information on their website here: http://www.translink.ca/en/Plans-and-Projects/Roads-Bridges-and-Goods-Movement-Projects/Pattullo-Bridge/Pattullo-Bridge-Rehabilitation.aspx Hope that this helps! Tractor trailer traffic should be banned or limited to outside rush hour. Most trucks need to use two lanes to get across the bridge. How are they going to do get across with one lane closed. Use som common sense. Limit the traffic to vehicles with two axles. That still allows straight trucks and cube vans to use the bridge. Unfortunately, the Pattullo Bridge will need to be replaced in the coming years. The current rehabilitation work to the bridge deck will extend the life of the bridge until the new bridge is built. Because the Pattullo Bridge is an important truck route in the Lower Mainland and truck route networks like this are vital to the economy to help make sure goods get to the people and businesses that use them every day, trucks will not be banned on the Pattullo during rehabilitation. We expect that some trucks may opt to take alternate routes; however it’s important that we maintain truck access for all drivers, including trucks that want to continue using the crossing. Hope that this helps! Please disallow the trucks from using the bridge, they should take the Port Mann. I drive the Pattullo every day and rely on it for work. My drive is already about an hour from Tsawwassen and I am concerned that I won’t be able to make it to work in time with this closure. The trucks slow everything down and drive in both lanes most of the time. Alex Fraser is already terribly backed up. I’m not sure what my alternative is. Public transit is not accessible from where I live. I see that there are many people who have stated the obvious numerous times; large trucks on the Pattullo Bridge are a both a hazard and a major source of delays, even with all lanes available. Congestion on the bridge has been terrible since the tolling started on the Port Mann, not to mention the hazards caused by increased traffic. Now trucks are going to be allowed on the bridge with only one lane, despite the fact that they have repeatedly demonstrated an inability to stay within it? (This is contrary to the original announcement that trucks would not be permitted on the bridge during the construction.) Your explanations that the Pattullo is a vital route for businesses ignores the fact that they will still not be able to stay within the lane. (How much more slowly will these trucks be driving in order to attempt to stay within their lane?) Additionally, many of these trucks resort to using the Pattullo because of the high tolls on the Port Mann. It is a problem caused (in part, at the very least,) by Translink’s greed and inflexibility to compromise on a safer and better solution during the construction. Using “business” as an excuse to justify increased danger and delays clearly demonstrates their priorities. The time and safety of residents in the area who have no realistic choice but to use the Pattullo Bridge daily certainly isn’t a concern for Translink. The suggestion to essentially give Translink more money by taking the Port Mann Bridge to help alleviate a problem they helped create reeks of greed and insensitivity to the actual concerns of citizens in the areas. Leaving the equivalent of a form letter response to these comments saying that the feedback has been forwarded to Translink, is just passing the buck to an entity that has repeatedly ignored the concerns of citizens. It is of no help to anyone. Until decisions are made that reflect the genuine concerns of the people, your assurances and explanations will continue to be seen as a PR move by an unfeeling and uncaring corporation. I just love driving in every morning from South Surrey to Burnaby and reading the warning sign saying “plan an alternate route”. Have to laugh as by car it’s currently about 40 minutes. Using Transit down the King George route is 1:41 (their #s), Transit down hwy 99 over Oak Street is 1:38 and 99 over Knight is 1:58. So with all the other drivers of trucks and cars being suggested to consider diverting to Alex Fraser, IT’S GOING TO BE A MESS!!! THERE IS NO ALTERNATE ROUTE FOR MANY OF US. I agree with all the comments regarding the large semi trucks using the Pattullo bridge now and during the construction. I would say that 95% of the time these trucks will use both lanes for the entire trip over the bridge. This ties up both lanes and inconveniences all the drivers behind these trucks. Now imagine now that these same drivers only have use of one lane where they felt they needed 2 lanes to cross the bridge. Keep the trucks off the Pattullo or limit them to certain times of the day or even better, allow them the Port Mann at reduced rates until construction is over. The Port Mann has more and faster lanes but the tolls add up. Reduce the tolls until construction is over. Thanks for connecting with us here and sharing your concerns David. Because the Pattullo Bridge is an important truck route in the Lower Mainland and truck route networks like this are vital to the economy to help make sure goods get to the people and businesses that use them every day, trucks will not be banned on the Pattullo during rehabilitation. We expect that some trucks may opt to take alternate routes; however it’s important that we maintain truck access for all drivers, including trucks that want to continue using the crossing. No one wants trucks on the bridge but despite all the complaints your mind is already made up and all of the comments re said trucks on the bridge…which is one of the main reasons it needs upgrading and work…..will be completely ignored. Drop the amount of the toll on the Port Mann for trucks so its more financially viable for them to use it. Instead of greedily trying to extort money from the trucking industry you could be increasing the amount of revenue as more trucks will find it a better alternative if the cost is lower in comparison to the gridlock and extra fuel costs necessarily in using the Patullo. But of course you will send this to your project team for review, thank me for sharing my views…and do nothing but laugh because this is strictly a PR exercise. We hear your frustration and, at the risk of sounding like a broken record, we want to let you know that we are making sure that these comments are being forwarded to be sure that all concerns are being heard. The Pattullo Bridge is an important truck route in the Lower Mainland and truck route networks like this are vital to the economy to help make sure goods get to the people and businesses that use them every day. We expect that some trucks may opt to take alternate routes; however it’s important that we maintain truck access for all drivers, including trucks that want to continue using the crossing. We would be happy to discuss this further with you if you would like. Please listen to the feedback that is being given for at very most safety purposes. I drive the Pattullo every day and most trucks use both lanes driving down the middle of them to make it safely to the other side. What will happen when they do not have this option with only 1 lane open? How many head on collisions is Translink willing to let happen before they decide to remove trucks during the rehabilitation period for at least peak hours? Yes this route helps our economy by moving goods and services but putting dollars before people’s lives after considering numerous alternatives is deplorable. Whoever is making these decisions just need to drive this bridge any mon-fri during rush hour to see why it is not safe to allow trucks on the bridge during this time. We hear you and have sent this, and all the other posts expressing concern over truck traffic on the bridge during construction, to the project team for consideration. Thanks for connecting with us here, we really appreciate hearing from you on this. Please ban trucks from the Pattullo bridge during peak/rush hours. They can not even drive on it properly when they have two lanes let alone one! What a disaster this is going to be for those of us who live in New West and have to commute. I can not “change” my work hours as it was suggested. Thanks for your feedback. We have shared it forward with the project team. Please remove the trucks from using the Bridge during the upgrades. The work that will be done will only start wearing down the surface of the bridge. They have two other choices Alex Fraser and the Port Mann. Reduce the toll and it will make it much easier on all of us. I agree with the previous posters – remove the trucks. Have them take Port Mann or Alex Fraser. Yes please BAN the trucks from Pattullo bridge, they are not only slowing down the traffic, also a major hazard on those narrow lanes!!!! Thanks for your feedback here. We have shared your concern forward with the project team. if cannot ban trucks, please at least restrict them for peak hours. Thanks for your feedback. We will share it forward with the project team. Also, I strongly agree that all truck traffic should be banned from the Pattullo during the bridge deck work. Life in Westminster will be grid lock most days and trucks will exacerbate the problem. I walk to 7th and 6th three evenings a week at 4:30pm for yoga the traffic on all roads leading to the Pattullo is grid lock most of these three evenings. With only one lane the feeder streets will be even more clogged if slow moving trucks are allowed on the bridge during rush hour. I note one of your suggestions it to use the Alex Fraser, have any of you tried the access the Alex Fraser from hwy 17? It’s awful for trucks. I’m. Sure if the access was better you would get more trucks on board using this bridge, especially from all the truck locations and Delta port in and around the Pattullo. Hi Marg, Thanks for letting us know of your concerns about trucks using the Pattullo Bridge while the bridge is under rehabilitation. As an essential part of the major road network, the Pattullo Bridge serves trucks that get goods to people, agencies and businesses that rely on them. I have forwarded your comments to TransLink, as they have jurisdiction for the bridge and will be overseeing the construction. The Alex Fraser Bridge is the responsibility of the Ministry of Transportation and Infrastructure, so I have forwarded your comments about access from Highway 17 onto the bridge, to our district office. Can you recommend to Translink / Surrey to put back the left most lane on Scott road to be for bus access only to the Scott Road Skytrain station, otherwise just re-direct all the buses from this station to other stations farther away from the bridge, Gateway etc. The buses sitting in daily “Carmageddon” gridlock will not help anybody get anywhere. Perhaps this project could be accelerated to avoid the September 2016 back to school crush? And further to above comments, just ban the trucks from 6-9 AM and 3-6 pm, this really is the only practical solution. Thanks for your comments Q. As to our requests, please let the City of Surrey and Translink know your concerns as these fall under their area. I have no doubt the bridge needs this work and there’s no avoiding the closures and delays. I also have no doubt that the choice to “Maintain Truck Traffic” is to ensure traffic chaos and force people to pay tolls on the Port Mann (which shouldn’t have been tolled in the first place). I’ve been using the Pattullo daily since 1995 and rush hours were never fun but until the Port Mann tolls kicked in its rarely been horrendous. Now, mostly thanks to the huge new influx of commercial trucks that travel at 10kmh and use both lanes contrary to the law (see the signs at each end saying trucks use right lane). Housing prices are too high and wages have been falling for decades. So people move to the burbs and end up needing bridges because they can’t afford to live where they work. Toss in tolls and many lower paying jobs become pointless because your just working to pay tolls. Those that take transit will also end up with much longer trips thanks to all the buses stuck at other bridges (except the port man) thanks to people not being able to use the Pattullo. Good luck to all the service based business in Vancouver. Unless they raise pay rates they just aren’t going to get people to fill positions – they can’t afford to work there. As you mentioned, the bridge does need the work and unfortunately there is no avoiding the closures or the additional delays, particularly during peak times on alternate crossings. The Pattullo Bridge is an important part of the Major Road Network, and a truck route, needed for getting goods to the people and businesses that use them every day. We expect some trucks may opt to take alternate routes, however it’s important that we maintain access for all drivers, including trucks, that want to continue using the crossing. We’ll be sharing information regularly with media and online through DriveBC during construction to ensure travellers have the details they need to make travel decisions and alternate plans. We hear you and are sharing these comments forward for review. Take the trucks off! They drive under the speed limit and slows everyone down and with the current Front Street construction the right hand lane to New West is reduced to a waiting line. Thanks for your feedback – we have shared it forward on your behalf. Definitely agree with the other posters regarding truck traffic on the bridge. During the Olympics, when truck traffic to downtown was restricted to the overnight hours, there was little to no truck traffic on the Patullo Bridge, and traffic flowed beautifully. Reducing the weight and vibration from those large diesel-powered vehicles would also help to reduce the strain on the existing structure, freeing some of the dollars currently spent on maintenance to be used toward the construction of the replacement structure. But there don’t just need to be higher-volume crossings of the Fraser River, there also need to be MORE of them. Maybe it’s time to send some of those research dollars in the direction of determining additional sites for river crossings. Start by taking a look at all the small communities that once had the words “Landing” or “Crossing” in their name. Almost all of those once were the site of ferries similar to the now-defunct Albion Ferry. Can you please provide the locations of the 7 additional parking lots that you say you have identified? Translink has identified various places to park. They’ve set up a website that should help you. Go to: http://www.translink.ca/pattullorehab and click on the TRAVEL TOOLS tab. On the PARKING LOCATIONS map, the yellow pins are the additional parking locations that were identified. The others are pre-existing. I’m in agreement with the above two commentors that heavy trucks should be taken off the Pattullo Bridge. It IS an old bridge that Translink continues to throw money at for no real good reason and the netting on the north side approach is hilarious. Yeah, let’s ban the heavy trucks…5,000Kg and up to be precise. They can’t seem to stay in a lane either especially semis, a drawback of the narrow lanes or driver ineptitude is up for debate. I don’t know how many of these professional drivers I’ve seen whip up the right lane on McBride on the New West side to go as far as they can and cut others off, goes for a lot of right lane bandits in any event, if you must cut others off…expect karma is all I’m saying and no, your not more important that those who have been patiently waiting in the left lane because of people that seem to think last moment cutting in is the right thing to do. TO be honest, being from another Province, the lack of basic road rules and courtesy that goes on here…no wonder ICBC rates are sky high. Thanks for your feedback Ken. We have shared it forward with the project team. Why the hell would allow trucks on the bridge when traffic is reduced to single lanes. Its already a bottle neck with trucks. Traffic will now plug up all of New West including 6th, 8th, 10, and Royal. Move trucks to Port Mann and remove Port Mann tolls! Agreed. Wanna make it safer? Ban trucks. Then these yearly road repair shutdowns won’t be required. Save the $$ for the replacement bridge. It’s like Translink just loves to waste money on unnecessary crap. My question is, Who will enforce these restrictions? What happens if semi-trucks (3+ axles) are still lined up to drive over the bridge regardless? Will there be appropriate signage stating the axle restrictions because I have yet to see any anywhere but online. Thanks for your question. We have checked with TransLink and they have confirmed that, while there are no signs posted on the roadway highlighting restrictions around oversize and overweight vehicles, restriction details are included in the CVSE guidelines stipulating no oversize or overweight loads/vehicles are allowed on Pattullo. In other words, heavy trucks (three or more axles) were not allowed to use the Pattullo Bridge before rehabilitation and those same regulations apply during the rehabilitation work currently underway. We have shared your concern with the project team. Thanks for connecting with us here. I am in total agreement. I take the Pattullo in the morning and the Port Mann going home as there is no difference in time in the morning. The freeway is bottlenecked. I can’t change my hours either. Just another cash grab to make us pay tolls both ways. This impacts me greatly as I often stay and work a couple of hours and usually go swimming at Guilford 3 nights a week after work….guess I’m going to have to bite the bullet on this one as a monthly bus pass is more than one month of tolls two ways…. I would like to see all bridges tolled in the mainland but at a reasonable toll of $1.00, this way it makes it fair for everyone. Thanks for your comments and sorry for your frustrations. We’ll be sharing information to media and through DriveBC to keep drivers informed of estimated travel times on the Pattullo and alternate routes (Port Mann and Alex Fraser), and sharing the webcams, during Translink’s construction so decisions can be made on what route works best for them during peak hours. The bridge repairs are necessary and this plan is the least impactful to drivers at this time.